Most people on trial for their lives don't generally plead for justice to be done. But Briony Larkin is not your run-of-the-mill heroine. The novel opens in the aftermath of the death of Briony's beloved Stepmother, under mysterious circumstances. Everyone thinks she committed suicide, but Briony thinks she knows better. Briony lives to take care of her mentally unstable twin sister Rose. She believes herself a witch (a hanging offence in the Swampsea) and so keeps herself away from the swamp and the Old Ones who live there, in order to keep her powers and her anger and jealousy under control. As I said in beginning, a lot of this novel is based on Briony's psychology: her guilt for her sister's condition, her lack of love for those around her, her early admitted and deep-seated belief that she is truly wicked, only barely holding her dangerous powers in check. The story really begins when Eldric, a college-aged fellow from London comes to the Swampsea. His father has come to the village to drain the swamp in order to develop the land; the railroad is finally coming to town (the setting is early twentieth century, with references to switch on lights and motor cars). I was worried at first by descriptions of "golden, electric Eldric", afraid he would turn out to be yet another too-good-to-be-true hero, but Eldric, and his relationship with Briony, is much, much more interesting than that. Eldric has his faults: a certain lack of direction, a rebellious nature, but he's just what Briony needs. He makes it possible for her to begin looking at the world and herself somewhat differently. This is a novel of twists and turns, discoveries about one's self and others and stories and the fickleness of memory and the ways in which all these things work together to create some notion of a self. And I don't know that I want to say too much more about the plot, because one of the distinct joys of this novel is watching Briony's narrative unfold, as she unpicks the tapestry of her life. I really have only good things to say about this novel. The voice, characterization, and plotting are strong and sure. As a reader, I always felt I was in good hands, no matter what might happen next. 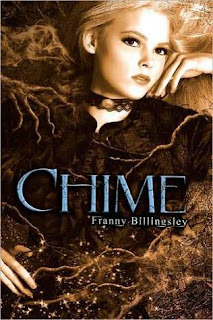 The novel goes to some very dark places, but I was happy to follow Briony and Billingsley anywhere. I will also note that the prose is delectable, rich, rhythmic, and original, especially in its evocations of the swamp. I mentioned earlier that this novel was short-listed for the 2011 National Book Award in the Young People's Literature category. There was an unfortunate bit of controversy at the beginning, as Lauren Myracle's Shine was inadvertently named as a short-listed title. The judges apparently meant to nominate this book instead. Altogether, it was a mess. But that was how I first came across this book. I find the National Book awards are a good go-to for finding good books to read. Previous years' nominees included Laini Taylor's Lips Touch: Three Times, which I have raved about elsewhere, and Canadian Martine Leavitt's Keturah and Lord Death, which is also fantastical and fantastic. Book design: I must say I think the novel is not well-served by its cover (the UK edition forgoes the choker but plays up the sparkles). The novel is both older and more sophisticated than the cover might have you believe. I see the UK paperback edition is going for a rather different look.